volatility is almost always associated with losing value. Although that’s true for those investors that willfully liquidate their holdings, long-term investors have historically seen tremendous benefits from times of equity market stress, as depicted by the Standard & Poor’s (S&P) 500 index. 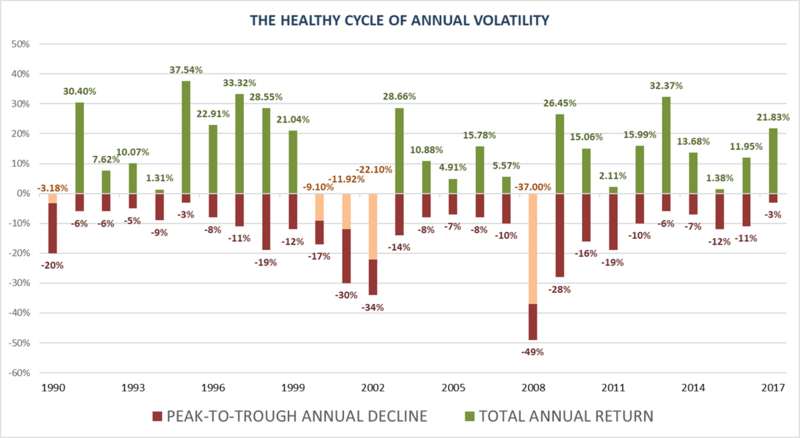 By recognizing the natural and healthy cycle of volatility, and accepting its frequency and potential magnitude, investors have the ability to acquire equity exposure at a discount. By employing objectivity and rational analysis, volatility has the ability to enhance long-term returns. Source: Bloomberg. John Hancock Investments – Market Intelligence. The opinions voiced in this material are for general information only and are not intended to provide specific advice or recommendations for any individual. All information is historical and there is no guarantee of future results. All indices are unmanaged and may not be invested into directly. The Standard & Poor’s 500 index is a large capitalization weighted index of 500 stocks designed to measure performance of the largest multi-national companies domiciled in the U.S. representing all major indices. Investment advice offered through Credent Wealth Management, a Registered Investment Advisor. This information is not intended as a solicitation or an offer to buy or sell any security referred to herein. Securities offered through LPL Financial. Member FINRA/SIPC.